LunchBots are stainless-steel food containers that just surged to No. 1 on my back-to-school shopping list. Creator Jacqueline Linder wanted to design safe, eco-friendly, and durable containers for her kids’ lunches. She wound up building a line of reusable containers that are hip enough for the school cafeteria, corporate lunch room, or casual picnic. After all, why should kids be the only ones with the cool lunch containers? 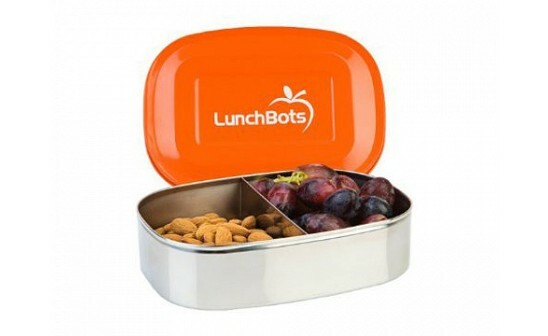 LunchBots are made from food-grade stainless steel (type 304) and come with a brightly colored stainless-steel lid. The Uno is perfect for a sandwich, while the Duo’s split receptacle keeps snacks or fruit nicely separated. They’re safe in the dishwasher, and they don’t hold stains like plastic containers do. Thanks to LunchBots, you’ll no longer need to tote disposable paper bags or unhealthy plastic containers to school or work. Food stays protected, so no more crushed snacks or smushed sandwiches. 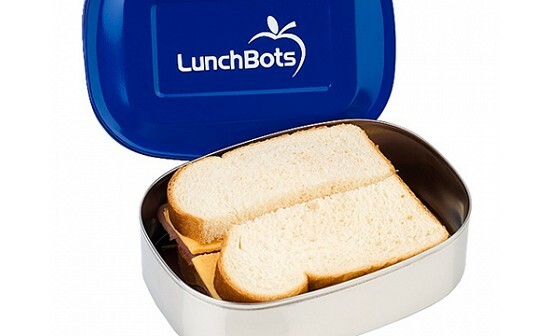 You can feel good sending your kids to school with their LunchBots — then tuck your snacks away in one too. Good afternoon Daily Grommet fans! Thanks for taking the time to learn more about LunchBots. Now is the perfect time of year to think about packing plastic-free and waste-free lunches for back to school. LunchBots are healthier than plastic and better for the environment. Both the containers and the lids are made from the highest quality 18/8 stainless steel. LunchBots are a great alternative to plastic baggies and containers. 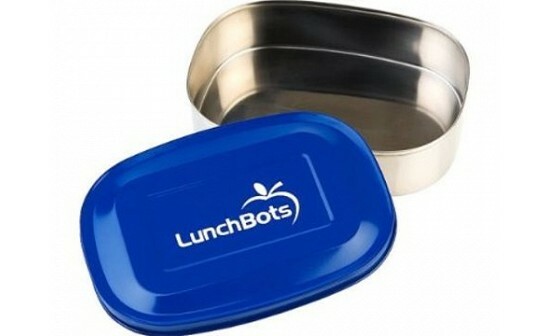 We also offer a school fundraising program, check out LunchBots.com for the details. We are thrilled to be featured on Daily Grommet today and we are happy to answer your questions. Thanks! Love the PTA / PTO program of a donation to the school. Great idea. And the product looks perfect too. Nice Grommet. I love this idea - I'm sick of those plastic bags too (and feeling more and more guilty about using them these days). But my question is whether these affect the taste of the food? I love this idea! I've been using plastic re-usable containers for my kids' lunches, but worry about the off-gassing and potential for bacteria to linger. This is fabulous! Great idea -- and very stylish! Hi Mary, 18/8 stainless steel is extremely durable and does not leach, so it will not affect the taste of the food. LunchBots are even safe for acidic foods and will not rust. Thanks! @Claire, Lunchbots only weigh a few ounces -- we've been using them every day since the start of school, and it really does not make a material difference in my son's backpack. Besides, I feel good about not packing in plastic baggies -- and I think there's a cool factor associated with these eco-friendly, unique snack and lunch containers in his fourth grade classroom. I think the Lunchbots look cool! I'd love to see them first-hand--will see if any local retailers stock them. It is interesting they were able to make stainless steel lids that will fit well--so often you see SS containers with plastic lids. Thanks for the post! If you have a high moisture item like fruit slices paired with a low moisture item like cookies or crackers in the lunchbot duo, have there been any issues with the dry items becoming soggy or damp? Hi there, do you ship abroad? if so, what are the options. These look good and fun. I really dislike plastic. @Robin - I spoke with Barbara who was in the video for this product and she says: "I've often mixed fruit and a dry snack in the one with the divider (two sections), and it works great!" Jacqueline chimed in as well cautioning about liquids :"Thank you for your interest in LunchBots. LunchBots are not water tight so we recommend packing dry foods only if there is a chance the container will not stay upright. On the Duo, there is a tiny gap where the divider is attached to the container so a tiny amount of liquid could sneak over to the other side. Hope that helps!" 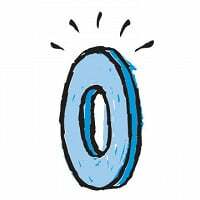 @Stuart - Unfortunately, Daily Grommet ships to US and Canada only at this time. LunchBots are stainless-steel food containers that just surged to No. 1 on my back-to-school shopping list. Creator Jacqueline Linder wanted to design safe, eco-friendly, and durable containers for her kids’ lunches. She wound up building a line of reusable containers that are hip enough for the school cafeteria, corporate lunch room, or casual picnic. After all, why should kids be the only ones with the cool lunch containers? 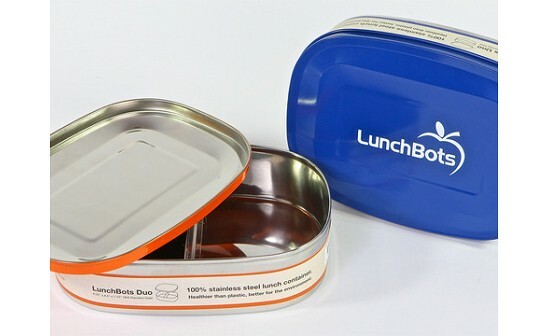 LunchBots are made from food-grade stainless steel (type 304) and come with a brightly colored stainless-steel lid. The Uno is perfect for a sandwich, while the Duo’s split receptacle keeps snacks or fruit nicely separated. They’re safe in the dishwasher, and they don’t hold stains like plastic containers do.